Carlton Draught, the Australian beer, has hit the screens (computer, television and cinema) with The Big Ad, a larger than life commercial with a larger than life budget. 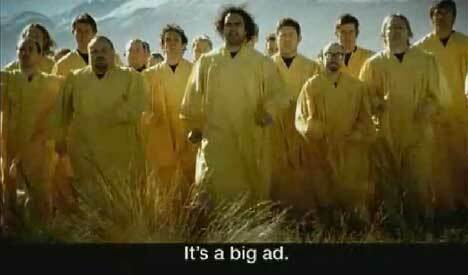 Yellow robed and white robed men run across a New Zealand valley that could have been used for Lord of the Rings. Red robed and blue robed men race towards them. They sing, to the tune of Carl Orff’s Carmina Burana, beer ad lyrics: It’s a big ad! Very big ad! It’s a big ad we’re in! It’s a big ad! My God it’s big! Can’t believe how big! For Carlton Draught! It’s just so freaking huge! It’s a big ad! Expensive ad! This ad better sell some blooooooody beer! It’s all DownUnder, and all online at bigad.com.au. The Big Ad was developed at George Patterson Partners Melbourne, Melbourne, by creative director James McGrath, copywriter Ant Keogh, art director Grant Rutherford, agency producer Pip Heming and group communications director Paul McMillan. The ad was filmed in a valley near Queenstown, New Zealand, by director Paul Middleditch, via Plaza Films, Sydney, with director of photography Andrew Lesnie and producer Peter Masterton. Paul Middleditch, director, is a Kiwi living in Australia, known for his award winning short films, and two feature films, Terranova (1997) and A Cold Summer (2002). He’s currently working on a new film, The Cowards. Paul’s humorous TV commercials for Hahn Premium Light, Spa Bomb and Beanbag Bomb, won the prize for Outstanding Funny TV Commercial at the 2003 Australian Comedy Awards. 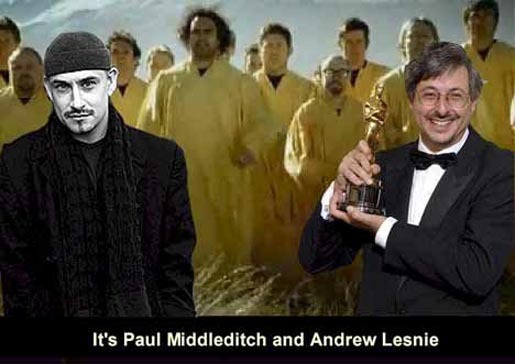 Andrew Lesnie, director of photography, is an Australian known mostly recently for his work in New Zealand with The Lord of the Rings, (2001-2003) which of course won him an award for cinematography. He was director of photography for Babe (1995) its sequel and several other movies between 1983 and 1998. He was a guest director of photography in Dark City. His work for King Kong is now in post production. It’s about time his Wikipedia entry was updated. Paul Middleditch also directed Budlight ‘Fridge’ & ‘Frisbees’, Big M ‘Piano’, Carlton ‘Canoes’, Diet Coke ‘Pool Boy’ and NEC’s ‘Parabola’. Editing was done by Peter Whitmore at Winning Post, Sydney (now at The Editors). Visual effects were mastered by Animal Logic, the company that worked on the Matrix movies. The Animal Logic team included VFX Supervisor Andrew Jackson, senior compositor Angus Wilson and VFX producer Caroline Renshaw. Animal Logic have revealed the secrets behind the Big Ad visual effects. I’ve been wondering how they managed to get 300 actors to become 3000 actors. 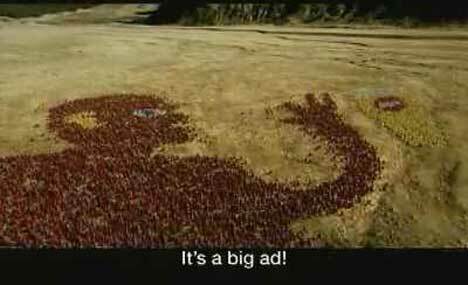 As I suspected, 3D computer-generated human extras were used for the large aerial crowd shots, manipulated using Massive software, the software known for its use in Lord of the Rings. Animal Logic also provided matte paintings to enhance the epic mountainous feel of the NZ backgrounds. Kindly the Animal Logic site gives us a 5 MB quicktime version of the Carlton Draught Big Ad, along with comments by Andrew Jackson, VFX Supervisor. Music was directed by Cezary Skubiszewski the music director for The Rage in Placid Lake, with the Melbourne Symphony Orchestra and Melbourne Chorale. The Big Ad site says something about being for over 18 year olds. I assume that refers to the beer, not the ad which has been shown on television in Australia. It’s streamed in three different sizes with Vividas Player. The voices we hear on the Big Ad are those of the Melbourne Chorale, accompanied by the Melbourne Symphony Orchestra. The lyrics for the Carlton Draught Big Ad are set to the tune of Carl Orff’s “O Fortuna”, from the ‘scenic cantata’, Carmina Burana. It’s the chorus sung at the beginning and end of the work. Carmina Burana is the name given to a collection of over 1000 poems and songs from the thirteenth century. Most of the poems and songs were satirical in nature, written by students and clergy. The lyrics cover topics such as the fickleness of fortune, the shortness of life, and the pleasures of drinking, gluttony, gambling and lust. Download the original song, “O Fortuna” from Carl Orff’s Carmina Burana from iTunes – features André Previn, Gerald English, London Symphony Chorus, London Symphony Orchestra, Sheila Armstrong & Thomas Allen.